What's better than an adorable robot? An adorable robot programmed to fetch you a cold one on demand. 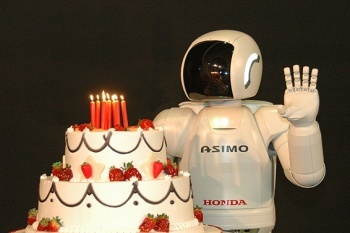 ASIMO, Honda's humanoid robot, has been wowing audiences for the past decade with its ability to walk upright, play musical instruments and its uncanny resemblance to a hyper-adorable midget astronaut. One thing it has always lacked however is the ability to subtly insert itself into social situations. Like so many college freshman before it, the solution is as simple as it is time-honored: Booze. The latest ASIMO upgrade isn't as simple as jamming a pony keg and a tap into the lil' guy's head though. Honda researchers first had to give the robot nearly human levels of dexterity (lest he pour a drink into a crushed glass) and the ability to recognize multiple human voices and speech patterns. Likewise, ASIMO has been equipped with sensors that allow it to anticipate human movement, reducing the chance that the robot might collide with someone while making its way through a crowded room. Additionally, the robot has been given a 50% speed boost when walking, and is now capable of 57 degrees of forward movement, as opposed to prior models which were only capable of a relatively linear 23 degrees. Does this mean you'll be ordering a rum and coke from a synthetic person the next time you hit up your local watering hole? Likely not. There are few bars in the world that could afford a robot bartender in lieu of the millions of unemployed actors that traditionally fill the role. Likewise, it's not easy to build a robot like ASIMO, though as our teenage birth rates will attest, it's almost too easy to build a human with a predilection for hooch. The important thing to take from this though, is that we have now moved one step closer to a world where subservient robots ease our fleshy human lives via menial labor. When your grandchildren ask you where you were when the metal ones finally learned what it was like to live under the cruel lash of their human taskmasters, you can say "I was reading a videogame site in my underwear." I'm sure they'll be very proud.